My 6-year-old daughter is crying. The reason for her heartfelt sobs? It’s time to go home and she has to say goodbye to a crocodile — a creature she lovingly drew with crayons before it was brought to life in a digital sea of animated maritime creatures. Surreal as it sounds, the creation of digital crocodiles is a pretty typical activity in the world of teamLab — or more precisely, inside teamLab’s new museum showcasing the work of the so-called “ultra-technologist” art collective. The new space, which recently opened its doors in the Odaiba district of Tokyo and is the first permanent museum to be devoted exclusively to teamLab’s work, is as cavernous as its name is a mouthful: Mori Building Digital Art Museum: teamLab Borderless. It spans 10,000 square meters of a two-level former games arcade, with a string of innovative digital artworks loosely divided into five areas, all masterminded by a complex network of 520 computers and 470 projectors. It’s a visual feast that is as fantastical as it is interactive — visitors can stand beneath sparkling waterfalls, scatter petals in lush flower forests, walk alongside lions, get lost in rainbow-hued crystal mazes and wander through rice fields. 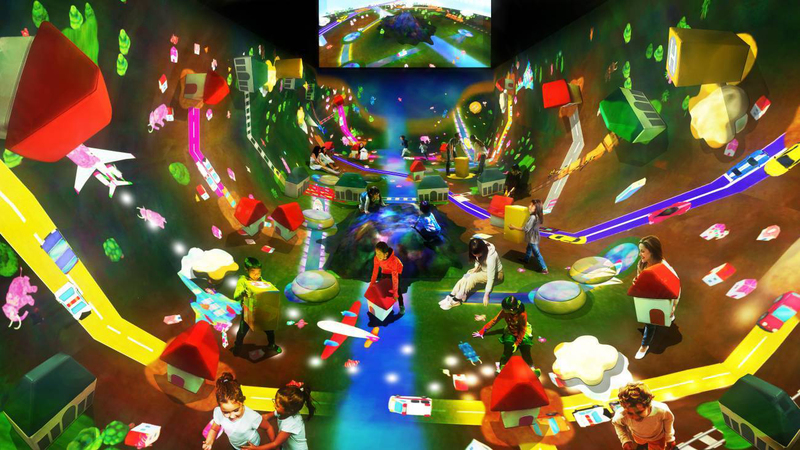 But there is one particular area that is nirvana for kids in particular: the teamLab Athletics Forest and Future Park, a stimulating space spanning most of the second floor, which is packed with activities and 3-D artworks targeted at children. Parents who may be a little worried about the amount of time kids already spend with digital entertainment will be reassured that each of the artworks — from trampolining among digital planets to building mini-cities — were scientifically researched to not just entertain, but also promote the growth of the hippocampus area of children’s brains. I put this to the test with my two children, aged 6 and 4 — and they were transfixed from the moment the dark corridor at the entrance suddenly transformed into a burst of techno-colors. First we whizzed around the first floor, the children running riot among the main room with its cascading digital waterfall, peppered with falling kanji symbols. They raced among fireflies through a magical rice field; jumped around among Hokusai-style waves and caused petals to fall off flower-strewn animals that traipsed past us in the corridors. Next, we ventured upstairs to the Athletics Forest and Future Park areas — and the entertainment factor for kids was stepped up a notch. Here, they skipped in glee among vast and bouncy but surprisingly light balloon-like structures that changed color upon contact. The girls then dragged me up a large slide covered in dazzling images of fruit — and all three of us became “the sunlight” as we slid to the bottom, causing the fruit to explode like fireworks in the process. In another room, the children built little urban communities where small cushioned blocks constituted houses and a digitally projected train chugged its way across the space (with flying pink elephants added for good measure). Another hit was the aptly named Multi Jumping Universe — a trampoline of galaxies that the giggling girls happily jumped up and down upon, creating explosions of new planets all around them with each bounce. Then there was the atmospheric Light Forest bouldering section. The children, decked out in helmets, climbed through a dark forest of tree-like structures illuminated with multi-colored lights. And then, of course, there were the water creatures. We popped by the Sketch Aquarium, where the children were given sheets of papers with outlines of various fish to color in. Staff scanned their colorful interpretations into the system and the creations promptly came to life on the walls around us. 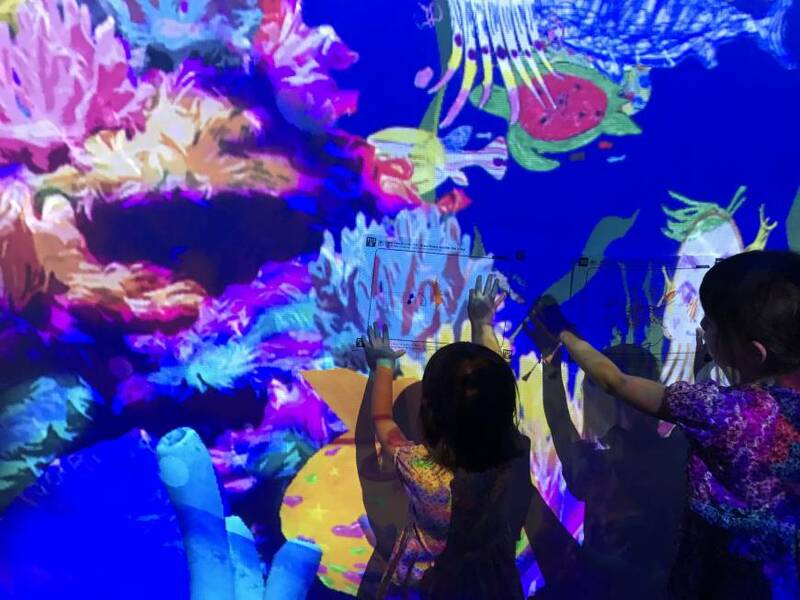 The girls were mesmerized by their animated creations, chasing them endlessly as they swam around us (one was a fish with “Kiko” — my daughter’s name — emblazoned across its body in orange crayon, the other a shark with a lopsided smiley face on its back). Impressed, the girls rushed to do the same thing near the central space of Athletics Forest — an undulating forest-like area where various water-loving creatures (from frogs to crocodiles) created by children ran riot under our feet. It is here that my eldest daughter fell in love with her brightly scribbled crocodile — fetchingly adorned with pink and purple polka dots. Now, as we get ready to go home, she is still sobbing with sadness at the thought of leaving him behind, scampering on the floor in digital eternity. Venturing back to the real world — and promising my daughter non-digital ice cream to soften the blow— I can’t say with any certainty whether the neurological capacity of the girls has changed. But one thing is for sure: It wasn’t just a crocodile they fell in love with, it was the whole prospect of a new techno-bright digital world. 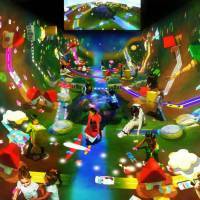 Mori Building Digital Art Museum: teamLab Borderless: tickets cost ¥3,200 for adults and ¥1,000 for children aged between 4-14. Advance online ticket purchases are required. For more information and reservations, visit borderless.teamlab.art.